Add all Ingredients to the Pressure Cooker. Cover, twist lid to the lock position and turn the valve to the sealing position. Press the beans/ Chili button. Or place the “pressure cooking” mode to high and cook 30 Minutes. Pressure will build up for about 10 minutes before cooking process begins. After the beeper beeps, allow the pressure to naturally release for at least 20-25 minutes. Then, turn the release valve to venting. 16oz Bag of Beans: Need 6 cups water or chicken broth. You don’t have to soak the beans overnight. If you turn the cooker to the sauté mode while preparing your ingredients, you can save pre-heating time when you are ready to begin cooking. Note: make sure to press OFF after you have completed the sauté mode, before starting the next cooking cycle. If you prefer firmer beans reduce cooking time to around 26- 27 minutes. If you prefer softer beans increase the cooking time by a few minutes. Finding your perfect cooking time/ texture is a personal preference which will come with experimenting with different recipes. TIP: If beans are not quite done to your liking. Place lid back to the closed position and press the soup mode with an open valve for 5 minutes. When cooking rice or beans, never fill the pressure cooker more than halfway full. Grains and Beans expand while cooking. As noted in the recipe it is important to allow the pressure to naturally release for at least 20-25 min before turning valve to venting. 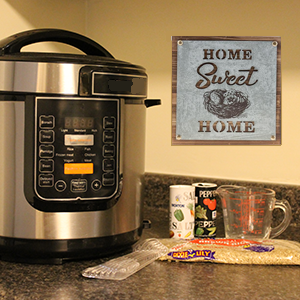 We have found that cooking beans in the pressure cooker is super easy and fast! You can use your favorite recipe for any type of China Doll or Dixie Lily beans. Cooking times will vary slightly on some beans.